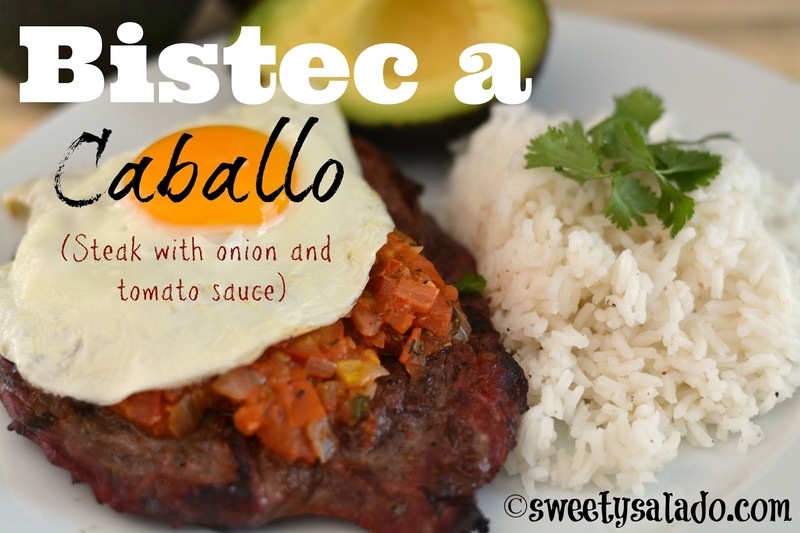 “Bistec a caballo” literally means “Steak on horseback” and it’s one of the strangest names you can use for a recipe that has nothing to do with horses. And even though the name may be a bit bizarre, and it’s completely different from what it really is, it’s really easy to make. 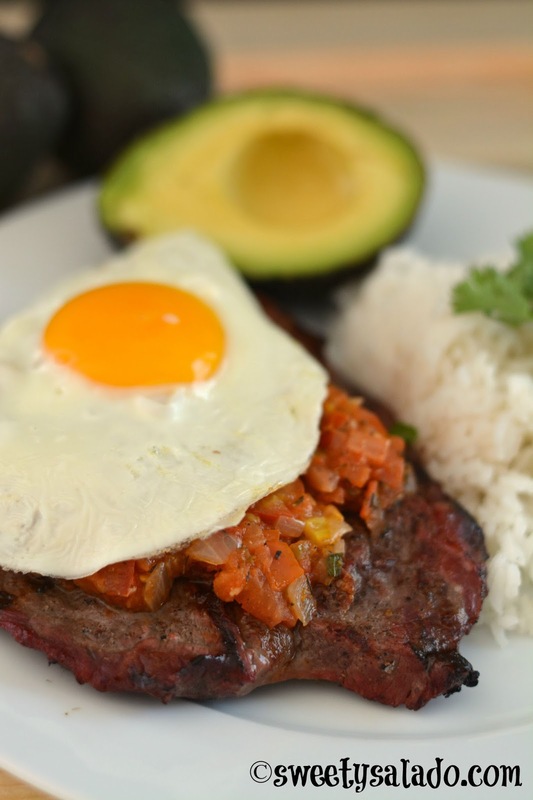 The ingredients are very simple and very popular in Colombia, they’re simply steak, hogao, which is a tomato and onion sauce, and a fried egg. The truth is that it’s a bit similar to the Colombian flank steak with creole sauce (sobrebarriga en salsa), perhaps because it’s made with beef and the sauce is made with onions and tomatoes. 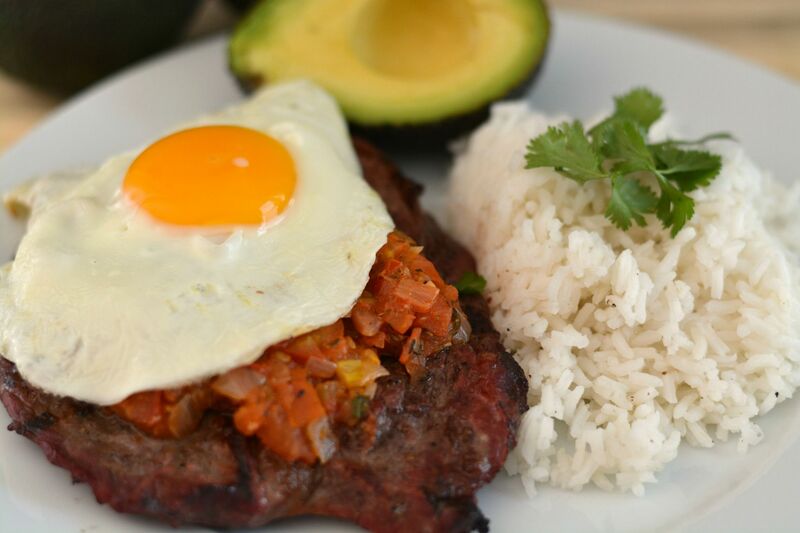 The fried egg is key because it has to be made sunny side up or over easy, meaning the yolk has to be runny so that it can melt over the sauce and the steak, giving it a delicious flavor. In a previous post that I wrote a while back I showed you how you can make a fried egg without actually frying it and how you can cook it so that you can end up with a runny yolk. Here’s the link: How To Fry An Egg. As I said earlier, this is a very, very easy recipe to make and I’m sure most of you already have all the ingredients you will need at home. Season the steaks with salt and pepper on both sides. Preheat grill over medium high heat for 5 minutes. Grease your grill with a paper towel soaked in a little bit of oil and grill the steaks until golden brown, about 5-6 minutes per side. Once cooked, set aside. You can also pan fry the steaks on your stove over medium high heat with about 2 tbsp of oil, pan fry for about 5-6 minutes per side. Heat the olive oil in a large pan over medium heat. Add the chopped onion and cook for about 3 minutes or until it's translucent. Add the chopped garlic and cook for another 1-2 minutes. Now, add the chopped tomatoes and cook for about 5 minutes or until they're tender. Season with thyme, oregano, cumin and salt & pepper. Serve the steaks on each plate, add the sauce on top of each steak, followed by a fried egg. You can also serve this with a side of white rice and avocado.